Late last year I came upon a dolly head that I had made sometime earlier for a poppet doll. It was a little too big for a poppet and too small for any of my other dolls so it had been abandoned. It was a cute little head though so I thought I could do something with it. 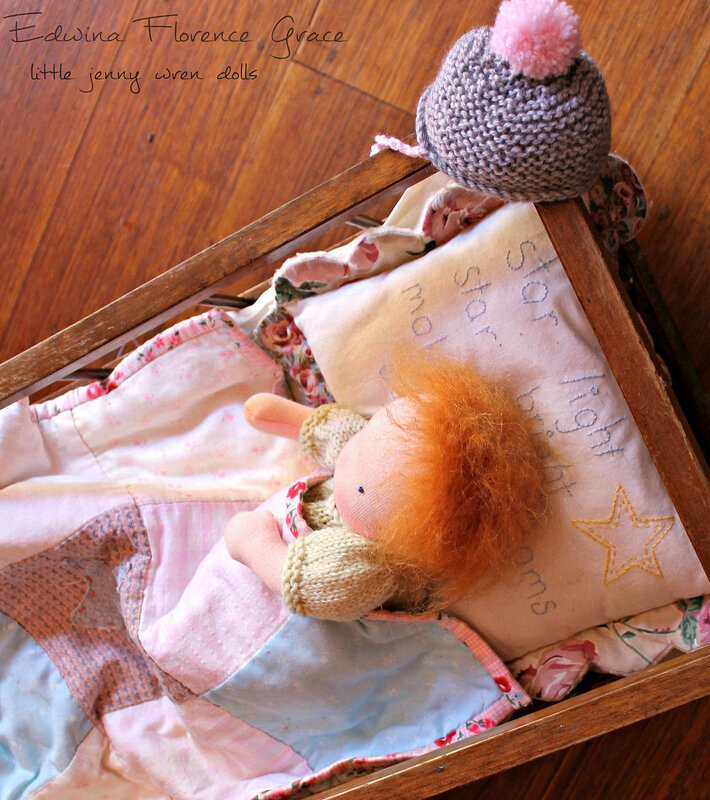 It was around the time of the big reshuffle of the playroom and sunroom and a little doll was on my worktable waiting to find a special place to sit. It was a baby doll my mum had bought me at a local doll fair. You know the sort, plastic head, legs and arms and a soft cloth trunk. Mum bought him because of his gorgeous little knitted outfit. Anyway he was lying there and I thought his head was around the same size as my orphan doll head. I wondered if I could make a doll that would fit the baby dolls clothes. The first little Bubbie, wearing the knitted pants from the doll my mum bought me. Apart from these pants and the hat the rest of the outfit didn't really fit. So using the baby doll as a kind of a template to get the right proportions I drew my doll body and then fiddled and faddled to turn it into a pattern suitable for the orphan doll head. I excitedly stitched it up and got the doll together super fast and was so pleased with the result. Such a cutie.The legs were a little short and stubby so I changed that on the second go. The first bubby in a hat made from a Winterludes pattern, it was cute but a bit small. I loved to knit for my own three babies so I thought knitted clothes would be perfect for this little one. I much prefer mostly knitted outfits for all my little dolls because sewing little clothes drives me to despair. You can see my little dolly clothes in this album and here . The protype bubbie and the first bubbie that would be sold with their big friend Lucie. The second doll had longer legs. The protype bubbie is wearing another winterludes pattern, this time too big but it was fun to make. I was so very pleased with bubbie doll MKII. I knitted her a gorgeous outfit of clothes using my patterns I designed for my poppet dolls ( Oh except her boots, they are a Winterludes pattern but I use my usual bootie pattern now just scaled down) and she ended up looking so cute , Miss Edwina Florence Grace. So that's how the little jenny wren bubbie was born. Very cute, very sweet and I am just about to make another one or two now.